The 1980 Robert Altman movie "Popeye," starring Robin Williams and Shelley Duvall, was filmed on Popeye Village, which still stands in Malta. One local growth industry on Malta is movie making. In the past 10 years, 18 major movies and TV shows have shot scenes on the island, ranging from "Midnight Express" to "Gladiator," "League of Extraordinary Gentlemen" and "Troy." Most of these movie sets are struck when the filming is done, but one has been preserved as a tourist attraction. When selecting locations for his 1980 movie "Popeye," starring Robin Williams and Shelley Duvall, director Robert Altman hit upon the idea of importing a boatload of Canadian lumber into a largely treeless area on the western tip of Malta. He erected the fishing village of Sweethaven in a remote cove previously known as a place to dump old anchors. Now known as Popeye Village, it's situated a mile off the main road. There's the entire set, instantly recognizable to anyone who saw "Popeye," along with a short history of the film, bar, restaurant, kiddie fun park and, of course, gift shop. 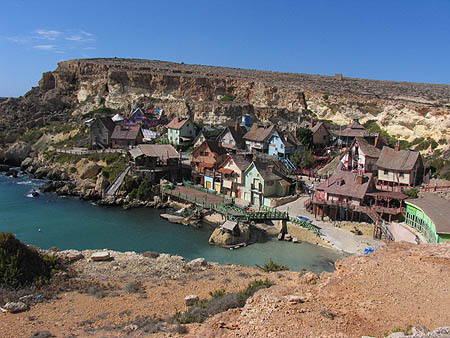 Totally incongruous with anything around it, Popeye Village is unique to Malta's mystique. For a complete list of Malta's movies, including locations and stars, check out www.visitmalta.com and click on the Interactive Movie Map.